The National Kitchen & Bath Association (NKBA) is the premiere association of designers, remodelers, distributors, retailers, manufacturers, fabricators, installers, and other professionals. Fifty years after its inception, the NKBA has a membership of more than 60,000 members. With more than 50 chapters throughout the United States and Canada, our association is the leading source of information and education for all kitchen and bath industry professionals. The mission of the NKBA is to enhance member success and excellence, promote professionalism and ethical business practices and provide leadership and direction for the kitchen and bath industry worldwide through a wide array of programs, services and as the host of the world’s largest trade show, the Kitchen & Bath Industry Show (KBIS). Every year, we bring exhibitors together to showcase new ideas, products, and services. The NKBA has raised the professional bar for the entire kitchen and bath industry through its professional development and certification programs. The NKBA’s certification program emphasizes continuing education and career development and includes designers and professionals in all segments of the kitchen and bath industry. To find out more about the NKBA go to www.nkba.org. The (NKBA) National Kitchen and Bath Association is a growing non-profit trade association with more than 36,000 members. We’ve led the kitchen and bath industry for over 50 years by providing resources for consumers and industry professionals. 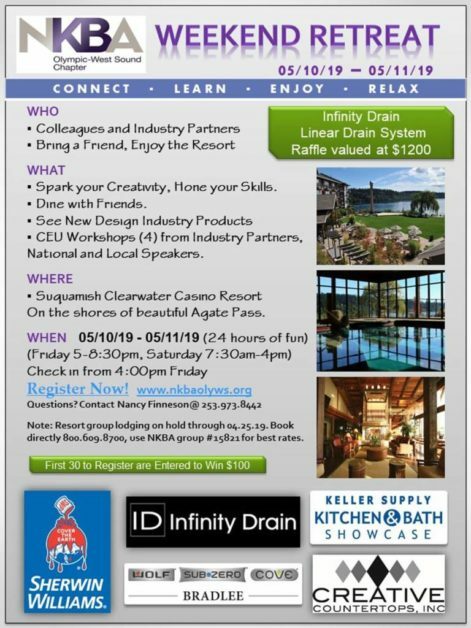 Not only does NKBA host the world’s largest trade show, the Kitchen/Bath Industry Show & Conference (K/BIS) and offer educational programs, but we also enhance the success of our members by promoting professionalism and ethnical business practices. In order to benefit consumers, our association monitors national and state legislation to protect the industry, our members and consumers. NKBA Kitchen and Bath Designer Certifications are based on written examinations and extensive industry experience. NKBA Certifications lets consumers know that their designer’s professional skills have been independently evaluated and tested that they are committed to improving these skills through ongoing education and professional development. With more than 50 chapters throughout the United States and Canada, the National Kitchen and Bath Association is the ultimate source for kitchen and bath resources and the primary means of uniting the industry! Click here to find a member in the West Sound vicinity.